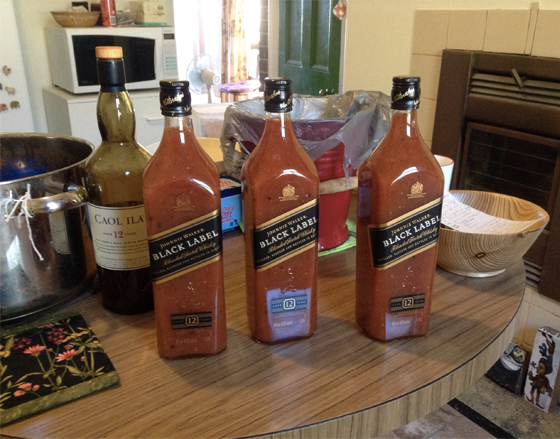 To make 4 litres of sauce…I bottle the sauce in empty Whisky bottles..with dregs..any spirit will do..these are STERILE bottles. A large stock pot is needed..measure in 4 litres water and mark the depth of the water on a wooden spoon handle…this will tell you when the liquid sauce has evaporated to a thick enough consistency. Discard the water. You will also need a mouli mill to separate the skins and pips from the boiled juice…you could push it through a sieve..hard work and I have never tried it. Chop up the tomatoes a bit.. ..in half if Romas…..and put in pot with the apples chopped up…skin, pips and all and the peeled brown onions and garlic chopped up. Pour on 250 ml vinegar. Add the sugar and the salt and start to bring to the boil. Stir it all up. Let it boil till the apples are soft…stirring occasionally so it doesn’t stick. Then put it through the mouli mill..using the remaining 500 ml vinegar to wash the last bits through. Put the juice back into the pot. In a little square of muslin cloth put 3/4 tablespoon peppercorns and 3/4 tablespoon cloves…tie up with string..put in the pot too. I grind up 3/4 tablespoon whole pimentos in a pestle and mortar and tip that in. Bring back to the boil..stir occasionally..squeeze the muslin bag with a wooden spoon occasionally too to get the flavours out. Keep evaporating till the level on the spoon handle is reached. Pour straight away into the bottles and cap them. This sauce does not have to be kept in the fridge.